Cytokines are an important group of proteins realizing intercellular communications among cells of the same tissue (paracrine) or of different tissues (endocrine). Such communications are essential for the correct synchronized reactions of the cells of different tissues. In the literature different designations are used to denote these factors: lymphokines, monokines, interleukins, and growth factors, which are now unified under the common name cytokines. The main cytokines include interleukins 1 to 18 (IL-1 to IL-18); interferons α, β, and γ (IFNα, IFNβ, and IFNγ, respectively); tumor necrosis factorsα and β (TNFα and TNFβ); colony-stimulating factors — granulocyte, macrophage, and granulocyte-macrophage (CSF-G, CSF-M, CSF-GM, respectively); basic and acid fibroblast growth factors (aFGF and bFGF); and others. There are two types of human interferons, type I and type II, and interferon-like cytokines. Type I human interferons consist of six classes: IFN-α, IFN-β, IFN-ε, IFN-κ, IFN-ω, and IFN-ν. However, a large number of type I interferons are found in other animal species. Type II interferon consists only of IFN-γ. In addition, three related human interferon-like cytokines have been reported: IL-28A, IL-28B, and IL-29. There is only one IFN-β, IFN-ε, IFN-κ, IFN-ω, and IFN-ν, but the IFN-α proteins consist of twelve individual proteins. The IFNα/β genes are not split, whereas the IFNγ gene has introns. IFNα/β share a common receptor that is different from that of IFNγ. The two types of interferons induce or suppress the synthesis ofdifferent proteins. IFNα/β stimulate mainly the activity of the natural killer (NK) cells,whereas IFNγ stimulates mainly the macrophages. IFNα/β are stable at pH 2.0; IFNγ is acid labile. Differences are in the signaling pathway leading to the correspondingactivity. The different receptors and the differences in the metabolic signaling pathways open avenues for a combined clinical use of IFNγ and IFNβ or IFNγ and IFNα. In the latter case, the possible effect of IFNγ on the IFNα receptor has to be taken into consideration. This effect seems to depend on the cellular type. In the neuroblastoma cell line T98G, IFNγ suppresses the binding of IFNα to its receptor, possibly by affecting its dissociation constant (Kd). In other tumor cell lines (melanoma HMV-1, kidney carcinoma ACHN, Daudi lymphoma), IFNγ induces the receptors of IFNα but only under the condition that IFNγ preceded the treatment with IFNα. Insensitivity to the action of virus-neutralizing antibodies. Resistance to the action of an acid medium and thermostability at 56°C. Ability to inhibit reproduction of certain viruses in tissuecultures, i.e., absence of virus specificity. Besides these properties, interferon also possesses others which characterize it as a protein of low molecular weight with particular physicochemical properties. Details of the various properties of interferon are given below. 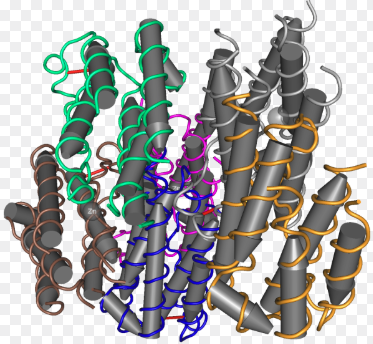 Interferon is a protein of low molecular weight. Its molecule contains the following components: tyrosine 2.3%, tryptophan 2.6%, arginine 7.2%, lysine 11.1%. It does not contain nucleic acids and only traces of carbohydrate are present. Interferon has a slightly acid reaction and contains disulfide bridges. The number of polypeptide chains has not been established. However, the reaction of this protein is alkaline and the isoelectric point is close to pH 6.9-7.1 or 7.2-7.8. One of the most important properties of interferon is its well-marked species specificity. This property of interferon was first described by Tyrrell. In his experiments the inhibitors obtained in the chorioallantoic membranes of the chick embryo and in cultures of calf kidney cells possessed antiviral activity only in homologous cells. Isaacs and Westwood also showed that vaccinal lesions in the rabbit’s skin were actively inhibited by interferon produced in cultures of rabbit cells, whereas chick interferon gave a very weak effect in such cases. The opposite effect was obtained in experiments on chick embryos, i.e., only chick and not rabbit interferon was active. Later the marked species specificity of interferon was confirmed by most investigations. The weakness of the antigenic properties of interferon is confirmed by the results obtained by Falcoff and co-workers, who found that repeated intravenous injections of human leukocytic interferon into adults and children were not accompanied by the formation of any detectable quantities of antibodies. No antibodies could be detected even in a child aged 6 years who received 3620 ml of leukocytic interferon intravenously over a period of 400 days. Solov’ev, V. (2012). Interferon: Theory and Applications. Springer Science & Business Media. Tsanev, R. G., & Ivanov, I. (2001). Immune interferon: properties and clinical applications. CRC Press.